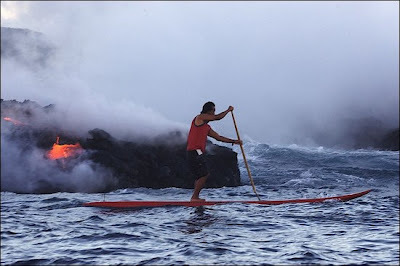 Check out this article from today’s Advertiser on Reid Inouye and Leleo Kinimaka stand up paddling along the lava flow on the Big Island. That looks pretty crazy. Looks like a big old school Hawaiian hot tub. The ocean was calmoff the Big Island three weeks ago, yet that’s when Reid Inouye and Leleo Kinimaka shared their most memorable day of stand-up paddle surfing. Paddling in the presence of a mythical Hawaiian goddess can be that powerful. Inouye, Kinimaka, two photographers and others aboard a boat crew ventured off the southeast coast of the Big Island on that day. 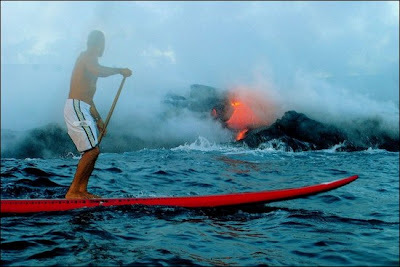 Inouye and Kinimaka rode their stand-up paddle boards in the ocean area where the current lava flow from Kilauea is spilling into the ocean. Inouye is starting a magazine for the sport of stand-up paddle surfing, and he asked Kinimaka to accompany him for the photo shoot. The lava was flowing into the ocean at a slow pace, so Inouye and Kinimaka were able to get as close as 10 feet to the action. Inouye said he fell off his board and discovered the ocean was a perfect temperature. Prior to paddling in the area, the group said a Hawaiian prayer (pule) and made an offering (ho’okupu) to the Hawaiian goddess of fire, Pele. Kinimaka said he had made similar offerings to Pele from the land, but never before from the ocean. He lives in Kona, but grew up surfing at various spots around the Big Island. Once he got comfortable in the conditions, Kinimaka said he decided to perform a surf dance with his board for Pele. “He was spinning his board around, doing some turns,” Inouye said. Inouye and several others in the crew said they saw the face of Pele appear in one of the lava flows while Kinimaka was doing his surf dance. Inouye said he now has some priceless memories of that day captured in photographs and video. He said the photographs will appear in the initial issue of Standup Paddle Magazine, due out in July. Kinimaka said it may have been a one-time session, and he would not recommend it for non-experts. Menuda pasada, aunque quedarían un poco pasaos de los vapores de azufre y todo lo que hecha eso...jeje...menudo vuelo.